Authorities on Saturday said one person died in a small plane crash near a central Oregon airport where people are gathering to view the solar eclipse. An employee who works at the San Carlos Airport said the small plane took off from the Peninsula city earlier in the day. The employee added that the plane was based at the San Carlos Airport. The Central Oregon Emergency Information Network said the pilot and a passenger were killed in the crash about 2 p.m. about a mile south of Madras Municipal Airport. Officials later said that only the pilot was on the plane at the time of the crash. 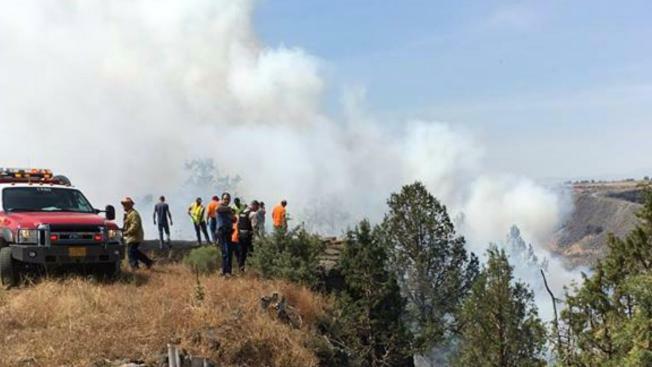 The Federal Aviation Administration says the small plane was approaching a central Oregon airport when it crashed near where people are gathering to view the solar eclipse, the Oregonian/Oregonlive reports. FAA spokesman Ian Gregor says the plane that crashed Saturday was a single-engine, homebuilt Wheeler Express. The Oregonian/Oregonlive reports that the Federal Aviation Administration and National Transportation Safety Board are investigating. Campers have been gathering at the airport for Monday's eclipse. About 200,000 people are expected in the area that's considered a prime viewing spot as the moon completely blots out the sun. NBC Bay Area's Sergio Quintana contributed to this report.